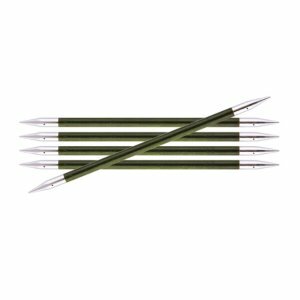 The Royale double pointed needles made from color-coded wood in a striking new striped pattern they also have added shiny metal tips that taper to a nice sharp point. The unique combination of wood and metal not only gives a refined look to the needles, but also provides an incomparable knitting experience. They are available in 6 or 8 length! ChiaoGoo Double Pointed Needles and Knitter's Pride Bamboo Double Pointed Needles are both similar needles: 8" (20cm), double point, and US 9 (5.5mm) US size. Knitter's Pride Marblz Double Pointed Needles From $9.24 to $13.20Select options on sale now!